On 5th April, the Victoria and Albert Museum (V&A) opened its Maqdala 1868 exhibition, a year-long display of 20 Maqdala artefacts, seized by British troops 150 years ago at the Battle of Maqdala, when the British “Abyssinian Expedition”, led by General, later Lord, Napier invaded Ethiopia and attacked the mountain fortress of Emperor Tewodros at Maqdala, killing all with its superior fire-power and ransacking the Emperor’s treasury. British troops carried off crowns and gold chalices, over 350 manuscripts, at least 11 tabots (representations of the Ark of the Covenant), many crosses, necklaces, drums, amulets, and even the Emperor’s clothes and his hair. 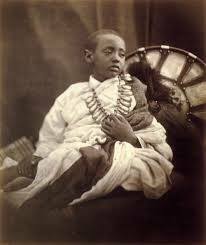 In addition, they took away the Emperor’s 7-year-old son, Alemayehu, who died from pleurisy, aged 18, in Leeds. Prime Minister Gladstone deplored the manner in which the expeditionary force had behaved and said the treasures should never have been brought to Britain and should be returned. Lord Napier agreed, stating that the treasures were only brought to Britain “for safe-keeping” until they could “be safely returned to Ethiopia”. Some restitution has been made. A Kebre Negest (Book of Kings), was returned following a request from Emperor Yohannes in 1872. A silver crown was presented to Ras Teferi in 1924 by King George V and in 1965 Emperor Tewodros’ seal and cap were returned by Queen Elizabeth II to Emperor Haile Selassie during a state visit to Ethiopia. Individuals in the UK have returned two tabots, a book of Psalms, a shield, two paintings and an amulet belonging to Emperor Tewodros. In 2007, Italy returned the Axum obelisk, seized during its invasion in 1935-36. During Ethiopia’s Millennial year (2008) the President of Ethiopia wrote to six UK institutions formally asking for looted Maqdala treasures to be returned to Ethiopia. Former Minister of Culture and Tourism, Hirut Woldemariam, has made it clear that full restitution is called for and has urged UK museums, institutions and individuals to return artefacts looted from Ethiopia, as it is “the rightful owner of the treasures”. UK institutions holding Magdala loot are the British Museum, the Royal Library at Windsor Castle, the Bodleian Library in Oxford, Cambridge University Library, Manchester University, and at least three northern regiments. The National Army Museum in London holds the Emperor’s hair, but has recently acquiesced to a request to remove an image of it from its website, at the Embassy’s request. The Museum’s decision to hold the exhibition was warmly welcomed and the Ambassador said the gesture was a step in the right direction and a springboard for further collaborations around conservation, research and curatorial exchange. But full restitution was the government’s policy. The Battle of Maqdala and its aftermath, he said, constituted “a deeply sad episode in [our] shared history.” He acknowledged the lead made by the Museum, in displaying, for the first time, some of the items from 1868 and encouraged other museums to follow suit. He informed guests, including African diplomats, journalists and academics, that even the Napier family had recently returned a necklace and a prayer scroll to the Institute of Ethiopian Studies in Addis Ababa. This was, he said, “Yet further proof that times change and so do attitudes!”. Ethiopian-British poet and Manchester University Chancellor, Lemn Sissay, spoke passionately about the chequered life in the UK of the son of Emperor Tewodros, Prince Alemayehu, who died at the tender age of 18 and is buried within the precinct of St George’s Chapel at Windsor Castle. Lemn is a strong voice in the campaign for the repatriation of the remains of Prince Alemayehu to Ethiopia. World-wide media attention has been prolific and continues apace. Meanwhile, the 200th anniversary of the birth of Emperor Tewodros II was commemorated from 10th to 16th April in the Amhara Regional State at Debre Tabor and in Addis Ababa. Then Minister of Tourism & Culture Hirut Woldeselassie said the Emperor had played a significant role in uniting and modernizing the country and establishing libraries. The Amhara Regional State, in collaboration with three universities in the region, are restoring Tewodros’ birthplace and its surroundings, and preparations are also underway to convert it into a tourist destination.